Update 2018: Ultimate AXA is currently unavailable. 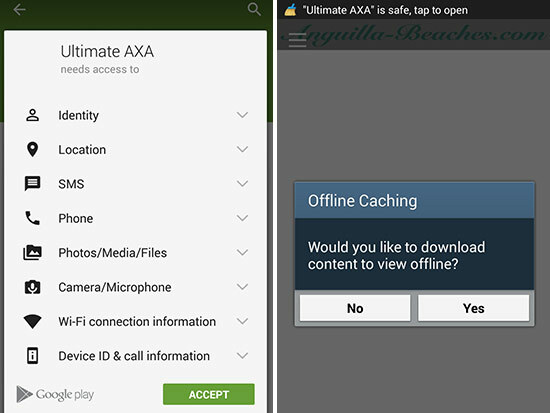 Downloading Ultimate AXA is like sucking every bit of data about Anguilla (photos, GPS points, information, phone numbers, restaurant hours, etc.) into one place, your phone or tablet, and then using it in incredibly productive ways. 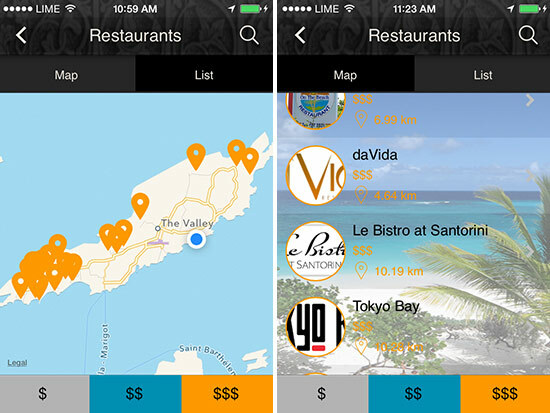 Find and navigate your way to any restaurant (100+ are featured inside the app, complete with hours and phone numbers). Locate the closest ATM or gas station when you are out and about, bouncing along the backroads. Find your way back to your villa or hotel after a day out of exploring. Discover scenic drives, hikes and special sights. Know and visit local events that are happening while you are on-island. 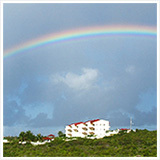 keep up to date with Anguilla in a wide variety of ways (when the vacation is over). 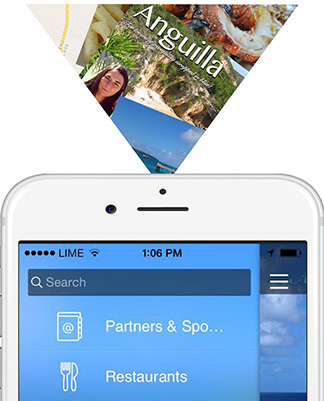 It is literally Anguilla in your pocket. Best of all, this indispensable life line is free. NOTE: The instructions below are written for iPhone and iPad. Differences have been marked as "Android Note" in a red box. 1. Providing your current location will show you where you are on the map relative to beaches, businesses, trails, etc. 2. 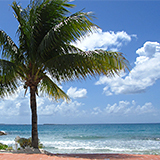 Offline caching saves the app's information and data points to your device so you can access them when you are not connected to the Internet, ex., when you are driving in Anguilla. A "walk through", explaining the app will follow (see photo on the left below). When you have finished reading, simply click the white button at the bottom of the screen to access the main app. The "walk through" window closes. Now, click the three-lined tab that appears in the top left (see photo on the right below). That opens the main navigation. Android Note: Prior to downloading Ultimate AXA via Google Play Store, you will be prompted to "accept" a number of items. Once you click "accept," the install process begins. Open the app once downloaded, please click "yes" to offline caching. This downloads all of the data to your phone, making it accessible when you are not connected to WiFi. To access the main navigation, click the three lined tab in the top-left corner (see below). Now, What's Inside The App? Once you have opened the main navigation, the first feature you will see is a "Search" bar at the top (see photo below on the left). Below that you will see many categories. Enter the first few letters, "R" "E" "S" for example, to quickly narrow down the category list. Then, click on it. Or, of course, you can visually scan and click on any desired category. 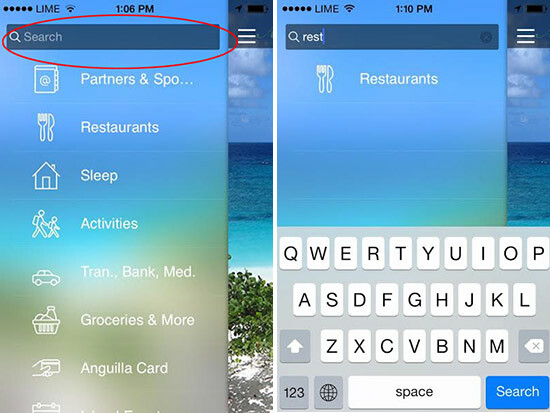 To search the entire contents of the app, close the main navigation (by clicking the three-lined tab again). Then swipe vertically, dragging your finger down over the sea of the background image. This opens a new search bar at the top of your screen. You fill find your search terms in the categories where they appear. Use the Partners & Sponsors map to discover which restaurants, hotels, activities, etc. 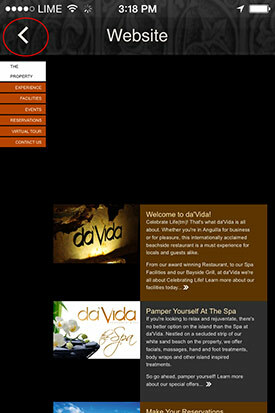 are Anguilla Card Partners. 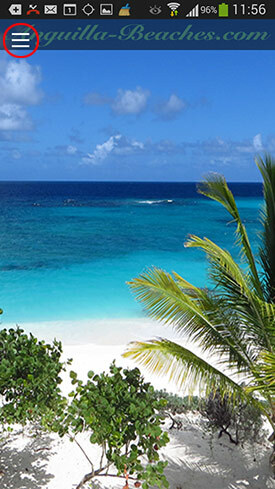 For more information about the Anguilla Card, which saves you 10% off all Participating Partners, please click here. 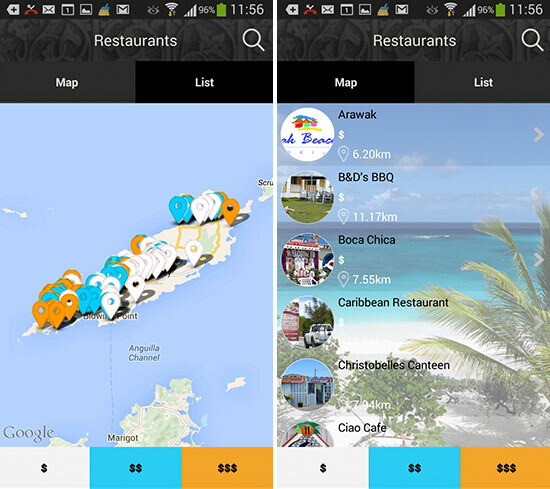 The first thing you will notice is you can browse all Restaurants either in "Map view" (see photo below on the left) or "List view" (see photo on the right below). When the Restaurant tab first opens you are in "Map view" by default. To access "List view" click "List." Map view is best used when you are out and about, wanting to discover what is nearby. Your location is displayed as a blue dot. When in map view, zoom in or out (by spreading or pinching your fingers across the screen). 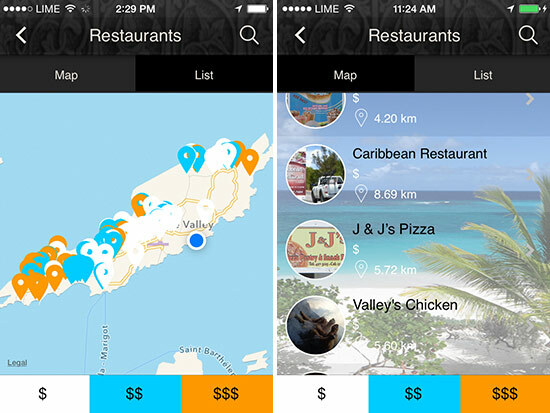 List view is useful for scanning restaurant ideas. All restaurants are listed alphabetically. 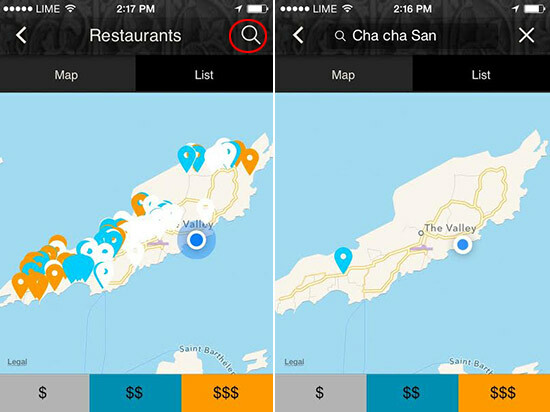 Click the "Q" mark in the upper right to search for any specific restaurant (NOTE: Only visible when in "Map view"). This will show your current location and your destination. GPS will track you as you go. Android Note: The functionality is exactly the same for Android. The only difference is your location won't currently display. This bug is at the top of our to-fix list. Next, you will notice that each map has categories. For Restaurants, they are: $ Restaurants, $$ Restaurants and $$$ Restaurants. When you start a map, all categories are toggled "on." So, to browse $$$ Restaurants only, click $ and $$ (bottom of your screen) to toggle them off (you will see them shadow out). Now, you will only see listings for $$$ (see below). To toggle other categories back on, simply click the $ and $$ again. Android Note: This particular feature is buggy on Android. For the moment, it is best not to toggle categories. Simply browse all. We are working to fix this. Click on any restaurant icon for more information. Each restaurant listing includes a short description and relevant information such as operating hours (hours are not always fixed and tend to be loose in Anguilla so it's always best to call ahead). At the bottom of your screen, you will see a bar with four actions: "Call Us," "Directions," "Email" and "Website." 1. "Call Us" will call the business if your phone number is North American. Otherwise, use the phone number provided in the information above. The other three, "Directions," "Email," "Website," all require WiFi access. 2. "Directions" uses Apple Maps. Apple Maps' directions, unfortunately, are buggy for Anguilla but can still be useful. Clicking "Directions" opens Apple Maps' directions in a new window. Click "clear" in the upper left to eliminate the directions. You don't need them because you can follow your progress with GPS. Be sure to keep this map open until you reach your destination and if you need it to get back. 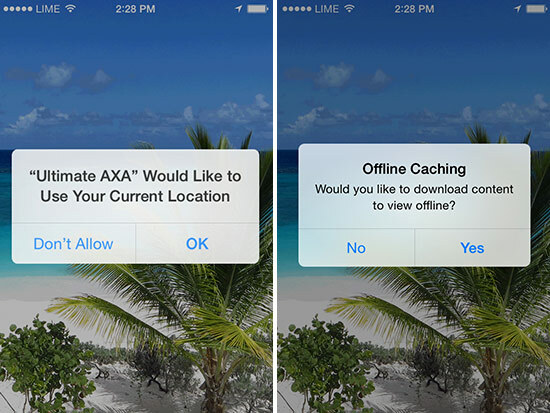 To return to Ultimate AXA while keeping Apple Maps directions open, double click on your iPhone/iPad's home button and re-select Ultimate AXA. 3. Clicking "Email" will connect you to a ready-to-send email message (auto-filled with the business' email address if available). Once you send an email, simply close the email to return to the app. 4. If a website is available, clicking "Website" will take you to the business' website. Click the back button that appears in the top left of the screen to return to the app. 1. When you send an email or open a website, simply click the back button that is built into your device (located on the bottom right of the device itself) to return to Ultimate AXA. 2. 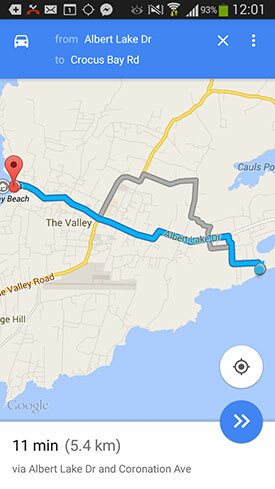 Unlike iPhone/iPad, directions work smoothly on Android because it uses Google Maps. To find the exact route to a point of interest, simply click "Directions." This will open a Google Map showing your location and your desired end-point. NOTE: Again, you do need to be on WiFi to get directions. Once you have opened this window from your hotel room, keep it open until you reach your destination/return to your hotel. To return to Ultimate AXA while keeping Google Maps open, simply hold down on your Android's home button and re-select Ultimate AXA. 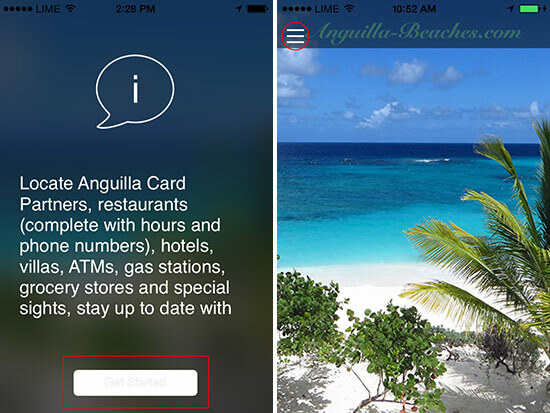 This link in the main navigation takes you to information about the Anguilla Card, your ticket to savings at 60+ Participating Partners, including discounts on villas, hotels, transportation, restaurants and a wide variety of things to do. Island Events lists upcoming special events around the island. A bar's Happy Hour, a restaurant's live music schedule, they are all listed by date. Each listing includes the venue's name, location and the hour the special event will take place. Constantly updated, be sure to check it during your vacation. No WiFi is needed to access this information. Clicking on an event provides details. NOTE: Clicking on "Get Directions" work in the same way as above. This final link in the main navigation makes it easy to do! This first version of Ultimate AXA has been a massive undertaking for us. We have ideas for making it more useful, and we are sure you will too. Also, with so many different types of devices out there, there are bound to be some bugs. So, if you have any feedback, tips or businesses you would like to see listed, please share via the comments below. We will be updating the information regularly and fixing all bugs in the near future. Any input you have is deeply valued and appreciated. Otherwise? That's it. Happy exploring! 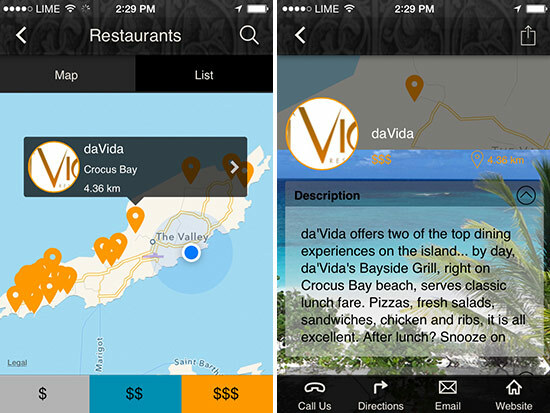 We truly hope this app adds to your enjoyment of Anguilla while you are here and keeps you in touch when you are not. Note: If you are a business owner here in Anguilla and do not see your business listed, please contact me via the form on this webpage. Getting to every establishment on the island was virtually impossible. We did not leave you out intentionally. Send me a note, and I would be happy to include you in the next version release!